I did the best I could to make use of time while waiting for the storm to break. I made breakfast, filled my water bottles, etc. When the storm decided to lighten up, I said goodbye to Jake, and I started on my way. 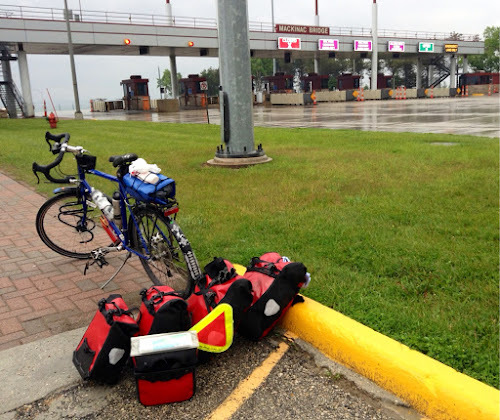 I made the short ride over to the Bridge Authority building next to the toll booth at the Mackinac Bridge. As bikes are not allowed on the bridge, cyclists pay a small fee to have themselves and their bikes transported via truck across the bridge. Waiting for the truck to take me across the Mackinac Bridge. The Straits of Mackinac, by the way, connect Lake Michigan with Lake Huron. I did not know this. I guess my bike route will be touching three of the greats lakes: Michigan, Erie, and Huron. All the better! The truck driver told me that the storm we just experienced was the worst that upper Michigan has had thus far this year. Yikers! The truck driver dropped me off on the south end of the bridge, just as the rain started to fall again. I ducked underneath the overhang of a building and waited out the storm. When I finally began on my way, I noticed a slew of colorful bicyclists in a nearby restaurant parking lot. I waved. They waved back. A short while later I saw three cyclists in the distance. As I got closer, I noticed that they all had Adventure Cycling safety triangles on the rear of their bicycles. I chatted with the riders, and I learned that they were on their last day of an 11-day Great Lakes Inn-to-Inn tour with Adventure Cycling. The three riders were Dereka, John, and Susan. Dereka and John are married and live in Maine. Susan (who is a very young 80 years of age) is from Cashere, WA. How cool is that? Just a few weeks ago I took a training course to learn to lead tours with the Adventure Cycling Association. And now, halfway across the country, I run into one of the Adventure Cycling tours in progress. This was definitely a highlight of my day. 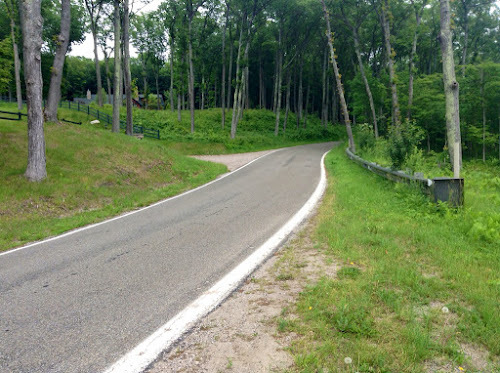 As was the off-route "Tunnel of Trees" road that I took for twenty miles from Cross Village to Harbor Springs. This was a recommendation provided by Andrew and Matt, the two Ride for the Guide cyclists I met three days ago. The scenic route is highly touted by the state as one of Michigan's most spectacular drives, particularly in the fall when the leaves are ablaze. The Tunnel of Trees is a narrow, winding, hilly road through a beautiful forest. 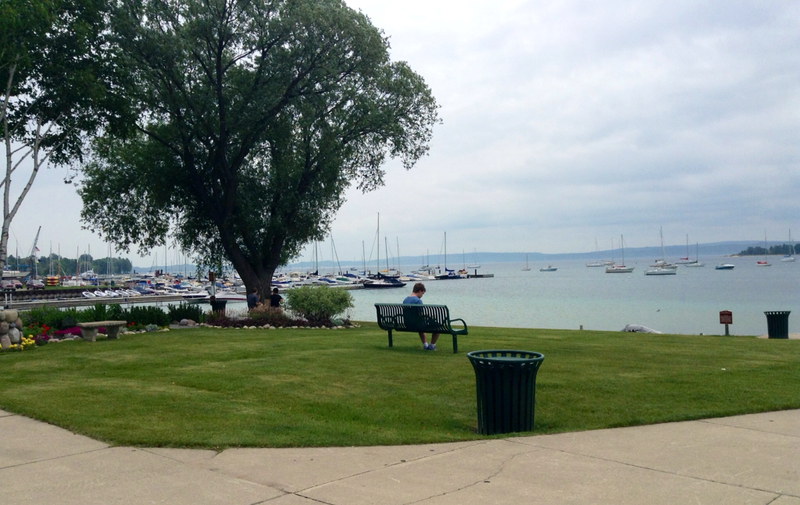 Occasionally, there are sweeping views down to Lake Michigan off to the right. On the left side of the road are gorgeous homes, with generous forests separating them. I particularly liked that the road was painted on either side with a thick, white line. It made me feel as though I was biking along a silky ribbon. When the wind picked up, the branches shook, dropping leftover rain drops from this morning's storm. The drops were refreshing. The Tunnel of Trees very much reminded me of the Avenue of the Giants in the Redwood Forest of California. Though the Michigan trees along this route stand no chance against the mighty Redwoods, they are just as gorgeous, in their own way. The Tunnel of Trees spit me out into the lovely town of Harbor Springs. As I was riding through the downtown area, I heard someone yell, "Sarah." I figured it wasn't for me. Who in Harbor Springs would know me? I looked anyway, and I saw Dereka waving. 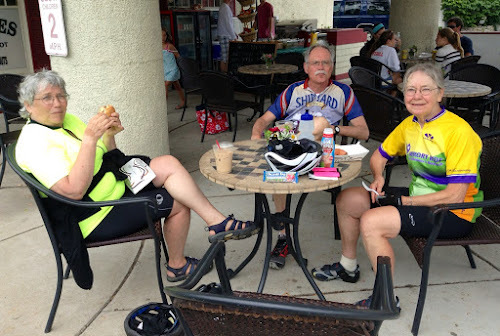 I pulled over to find all three Adventure Cyclists from earlier in the day grabbing lunch at a cafe. We chatted for a bit. Dereka and John said I'd be welcome to stay with them when I pass through Maine. Awesome! Susan shared a tasty energy bar from her hometown. Yummy! The town of Harbor Springs was cute and quaint. Adorable houses. Lovely shops. Even a marina! With sailboats! The pontoon was, by far, the most popular boat in Northern Wisconsin and the upper peninsula of Michigan. Now that I'm in the mitten of Michigan, sailboats are the predominant boat. I'm excited to be biking through the mitten. I think the riding will be far more interesting since I'll be passing more frequently through more populated towns. The ride seemed quite long today. That's partially due to a late start this morning (thank you, storm), partially due to a late evening last night, and partially due to the fact that I've now had four days in a row of 70+ miles of riding. I stopped mid-route for a chocolate milk break, to refresh my energy level. 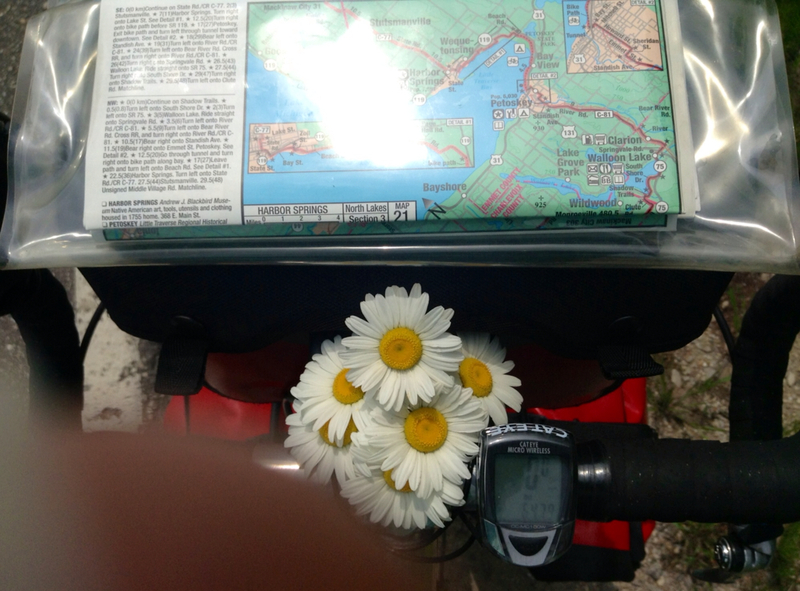 While I was at it, I decided to pick some daisies to spruce up my dashboard. 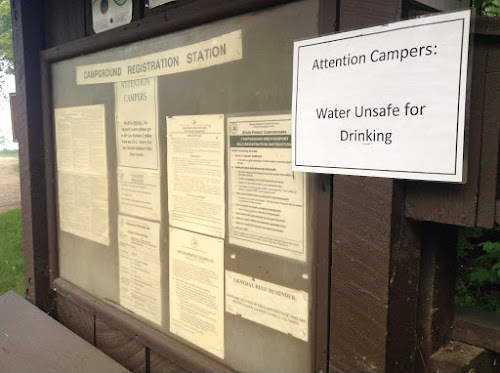 What I failed to mention about the camp from two nights ago, at Milakokia State Forest Campground, was that there was no water. It especially wasn't cool that the nearest water was more than 5 miles away. Not exactly what we wanted to see. Fortunately, we were able to make do. Andy boiled lake water, and Jake and I heated canned soup for dinner. I'm becoming less and less fond of the state forest campgrounds. To begin with, they have only the bare minimums - pit toilets and water pumps. But when you don't even have water, what's the point? A lot of "dirt bag" bike tourists follow the "it's easier to ask forgiveness than permission" principle and stay in city parks. I'm going to try being a dirt bag tonight, for the first time, in Boyne City. I've scoped out a couple of the parks. 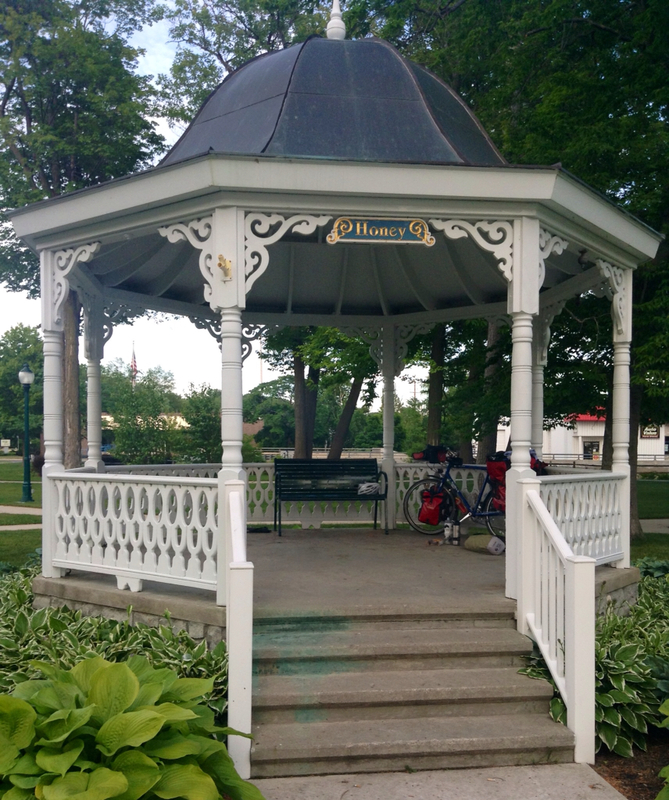 One park, close to downtown, has water, electricity, and a gazebo (great for keeping the tent dry in storms). It doesn't have a bathroom though, and the gazebo is not very stealthy. Another park a few blocks away has a not-so-obvious covered picnic pavilion, basball dugouts, water, and restrooms. Just no electricity. With so many options, I decided to made myself at home in both parks. I had dinner and recharged my electronics at the first park. I then went to the second park for some washing up and snoozing. Originally, I thought I'd sleep under the picnic pavilion at the second park. As soon as it started to get dark, I noticed there were twelve flood lights brightly lighting the pavilion. I unscrewed nine of the light bulbs just enough to turn off the lights. Unfortunately, I couldn't reach the other three bulbs. 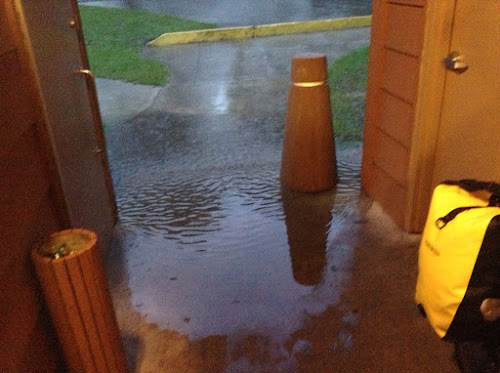 The only way I could have reached them was by scooting over some picnic tables. But that would have made way too much noise. So, I made my home in a baseball dugout instead. Dirt bagging is part of the adventure! I'm enjoying it all! 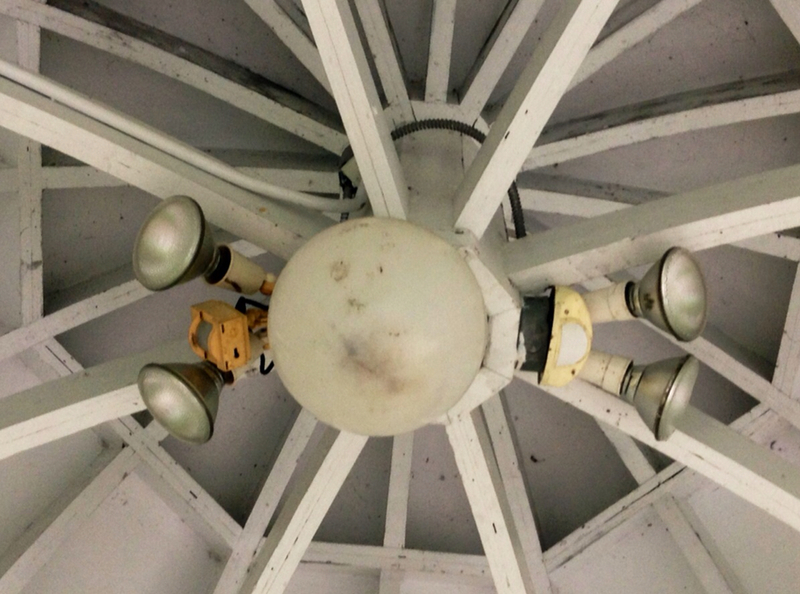 These security lights, on the gazebo ceiling, aren't exactly conducive to stealth sleeping.